The Royal Marine is a stunning vision of 'old and new' the infamous 'Bay Lounge' complimented by a stylish bar will remain entrenched in history. 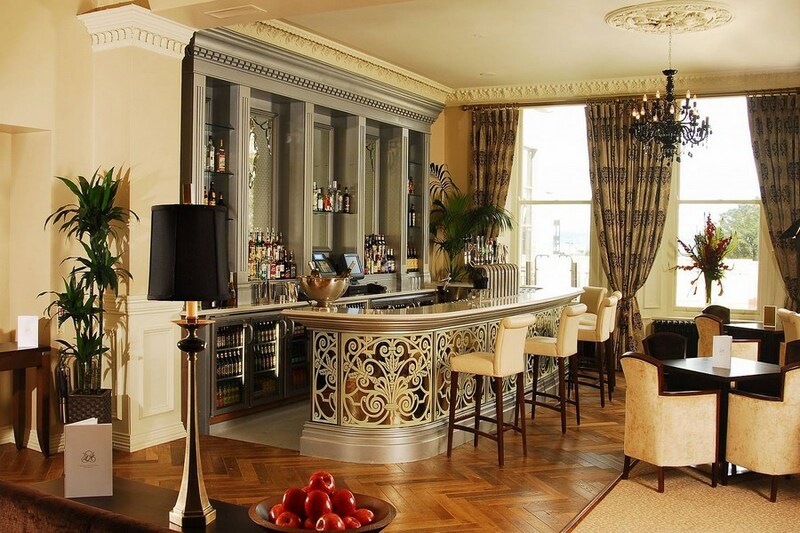 We intend to keep the Bay Lounge married in the memories of old by carefully restoring its unique characteristics. Enjoy the age old tradition of afternoon tea whilst overlooking the beautiful gardens with spectacular views of the harbour.The Royal Marine do not have Family rooms available for our offers. Transportation with easy access to & from Dublin City Centre the Royal Marine Hotel is located 2 minutes walking distance from the DART, instant access into the heart of Dublin City in less then 15 minutes. Car parking is complimentary to residents with 250 underground car parking spaces. From the moment we arrived the staff were excellent. If you are looking for a Hotel on the coast with a 15 min train journey into the heart of the City. the Royal Marine is the hotel for you. Their triple rooms are a single and a double so if you wish to have three beds you will need to make them aware of this in advance. A Beautiful hotel with friendly, helpful staff. The food was lovely and the rooms were fab, the most comfortable bed I have slept in in a hotel to date. Fabulous value for money! 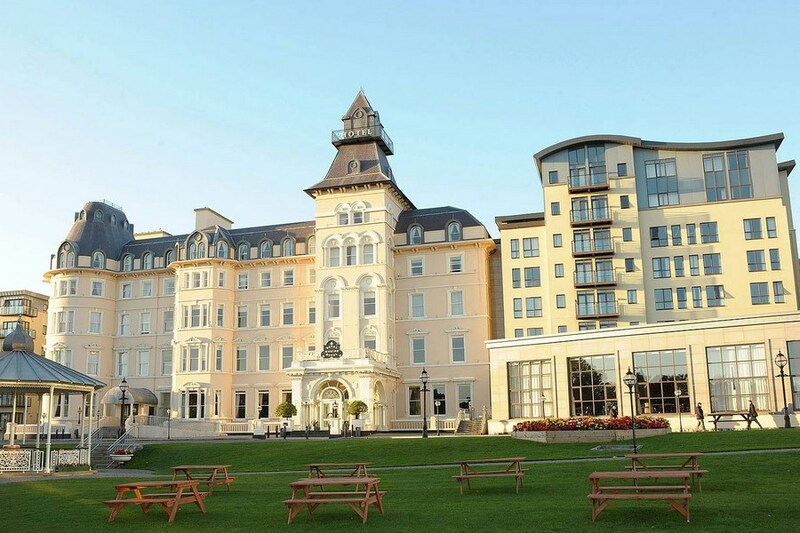 by Lorraine 3rd November 2015 We had a lovely stay in the Royal Marine Hotel over the Halloween Weekend. Beautiful room, well kept, and very comfortable bed. Lovely leisure centre with pool and sauna to relax in the evening. A nice breakfast served by a very attentive staff. Followed by a leisurely walk in the sunshine on the pier. We will be back to visit again soon. I thoroughly enjoyed my 2 day stay in the hotel this week. The friendliness of the staff is overwhelming. The homeliness of the hotel foyer is heartening. The food was really delicious. The rooms are beautiful. And the beds....magnificent. Outside, the sun shone on DunLaoire pier and an air of relaxation was apparent with strollers enjoying the lovely views of Dublin Bay. I`ll be back....as soon as possible. Stayed 2 nights at weekend, Hotel very wel kept, rooms cleaned well as was all other areas. Bar, restaurant nice with good food, singer on Saturday nice was great. Central location lovely grounds. Very nice area with plenty of shops and restaurants nearby. Went to Dalkey on the Dart nice town went into Sandycove to Rasam Indian on the Saturday night there was a mix up by us on the booking but they accomadated us and the food was great, would highly recommend, considering it is booked 3 weeks in advance we were very happy with the way we were treated. this is a magical hotel and location, like being on the irish riviera, charming and full of ambience. enjoyed shopping around the corner, and walks on the prom, dart into the city for a show, all 2 minutes away. fabulous room and breakfast, didn't want to leave. I booked a triple room at the Royal Marine Hotel. Everything was great, except the breakfast 'hot food' was stone cold. Maybe we were just unlucky. The setting of the hotel, bedrooms and ambience were great and I would return. I had to rush off to a meeting so didn't complain about the cold fry (thinking it was just a one-off). My sisters ate later and had the same complaint so now I wish we had drawn the staff's attention to it. Overall though I would give this beautiful hotel another chance. Great value break especially when use of the Leisure Centre is included. Great location and friendly staff. We had a wonderful stay for 3 nights in this hotel. Everything was perfect. A very high standard during our stay. We will be back. Very nice hotel, the rooms are well looked after and staff are very helpful Breakfest on both mornings of our stay was excellent. Hope to return soon. Very nice hotel, the rooms are well looked after and staff are helpful. The only thing I would change is that the extra breakfast space (outside Harry's Bar) should be kept well stocked. Would definitely return. We had a really nice stay in the royal marine, it looks fab from the outside and didn't let us down inside either, large hotel with lots of different seating areas which is nice. The staff were very friendly and more than helpful. We ate in the bar and it was really nice and good value for money. The rooms were everything they should be, warm, clean and the beds were very comfortable. We were sleeping 3 adults in our room and could have done with extra towels as there only seemed to be enough for 2 but that is a small thing, over all everyone in our party was very happy and would happily recommend. We had a most enjoyable stay in the Royal Marine Hotel. We have been a few times before and have always found it excellent. We were only there for 1 night but used the pool on two occasions as we had 2 children with us. Breakfast was lovely and the staff were very kind and helpful. 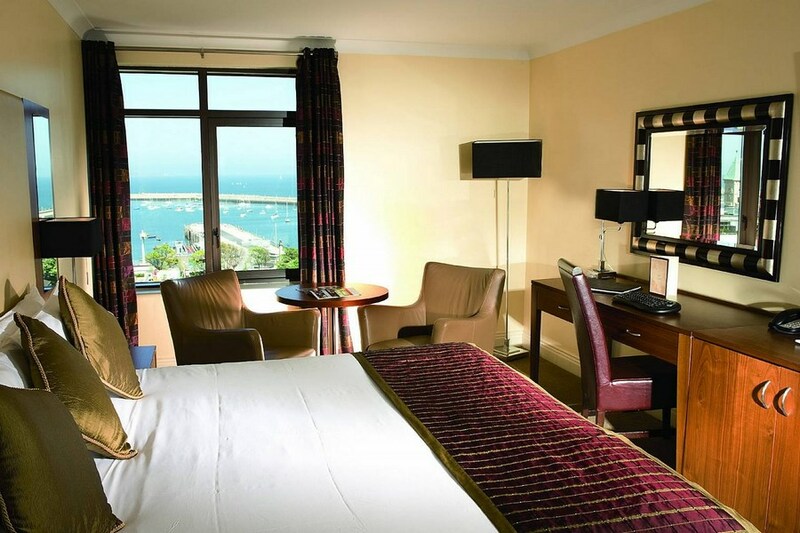 Dun Laoghaire is a lovely area and we will be returning to the Royal Marine Hotel in the near future. My daughter and I stayed at this wonderful hotel on the 11th July and had the most fantastic time. The staff and management were so professional and helpful. The food was excellent and the hotel itself spectacular. The room was very comfortable and did not disappoint. I would certainly stay there again. The breakfast choices were amazing and they served up to 11am on Saturday and Sundays. We stayed from 9th - 11th July on B&B basis. I had stayed before so I knew it had to be a sea view so just put this in the section when booking which is for requests. Just say it must be a sea view room and that you will pay hotel the additional supplement, I can assure you that you will not regret it. Also level 3 or 4 is good but this is only a request and cannot be guaranteed but they will do their best to accommodate this or any other requests you may have. I love this hotel, it is excellent , convenient to local shops, promenade and East Pier and the DART Station also lots of lovely walks for the more energetic! The buffet breakfast has anything you could possibly want, although if you want porridge, kippers or fried/poached eggs you will have to ask the waitress for these as they are freshly cooked to order,however the scrambled egg is really good. There is a wide range of food available all day. The hotel has a great atmosphere and the price we paid for the service and quality of hotel was an excellent deal. This hotel can be extremely busy at times. Excellent Hotel - would highly recommend for any kind of stay. Staff are very helpful and service was brilliant at all times. Have stayed here many times throughout the years and have never been disappointed. Could do with a bit of modernisation here and there, but it nothing that would put me off staying again. Looking forward to my next break there at the end of the summer! Nice hotel, good location, some of the staff at reception could be more friendly - they seemed dis-interested when we arrived, however the lady on the desk the morning of our departure was very pleasant. I would stay here again. Good welcome at reception and helpful. Hotel room was fine . Enjoyed tea and sandwich in open area at reception. Parking was handy. Breakfast was was not hot .Location ideal to centre of town and sea front. Hotel room staff everything was tops. Will be revisiting soon. We have just returned from a 3 night stay in The Royal Marine Hotel. The room was very spacious, clean, and more importantly, quiet. The staff are very friendly and helpful. The Breakfast where they have a buffet which serves everything from ceral, fruit etc to the full Irish, plus selection of breads, Danish pasteries etc. catered for everyones taste and appetite. We also ate in Hardy's bar plus the Restaurant and also the Bay Lounge. Overall food is lovely, very tasteful and it was only on our last night that we had to complain re the pork stir fry - the pork was as tough as anything. We explained to the waitress and she told the chef - my uncle than went to pay the bill and was charged for 2 pork stirfries which could not be eaten (well the noodles were lovely). Anyway it all got sorted on check out when I explained to a manager & he has given his word that my aunt and uncle will receive 2 free main courses on their return. All in all we had a lovely break and will definitely return. Also the leisure facilities are excellent. We had a great weekend. The hotel was excellent and the food great, the waiter on our table Saturday night was superb. I would suggest that a better use of bar staff on a Saturday evening should be to consider. Customer service, rather than top up shelves, should be the priority. Replenishing should de done in a slack period or when the stock is almost gone. Our stay at the Royal Marine was lovely, as always the staff are very helpful and the beds are the comfiest ever. My only complaint would be the prices of the food and the beverages. A cup of milk for my child cost €1.60. Beautiful hotel with an entrance and reception which are stunning, with an olde world feel. On checking in at 3pm reservations for dinner could not be made as it was booked out until 8.30pm, the dining area is very small which also becomes a problem at breakfast time, those in early, are rushed for the second sitting, and if there is no table free you have to wait in reception until called. We were unlucky as those in the room next door to us were trouble makers, after 3 calls to reception to report noise and fighting, security were sent up each time, but as soon as they left the racket continued, it was only when the guards were called at 6.30am and removed the offenders that we had any peace, which was way to late. The bar menu is basic, though the staff are very friendly and courtous, unfortunately they are let down by the "gentleman" in charge of breakfast, who is down right rude and has no manner, though he may have inherited this attitude from the manager on duty during our time there. Over all we were dissappointed, management didn't care that a corridor of guests were disturbed all night, just scibbled his email address on a plain sheet of paper, with a vague promise of a room upgrade should we return OR tea and a scone! Customer service needs to be up graded!! Very good hotel, location and facilities good. The hotel was superb, great location, very friendly staff, excellent value and the food was fabulous. Will definitely be staying there again. Another lovely stay at the Royal Marine. Great venue for a girlie getaway, or just to relax with your other half. Nice mix of old and new, in a fantastic location. Only issue this year was that there was a lot of noise during the night. We were woken up three times - twice with shouting in hallway and a third time when the same drunk guests set off the fire alarm! Did get an apology from reception when checking out though. Will deffo go back again. A firm favourite! I stayed in this hotel on 23rd November 2013 and I have to say, it's an absolutely gorgeous hotel. The room was a good size, tastefully decorated, the beds were EXTREMELY comfortable and the staff were fantastic. There is a spa in the hotel and guests get discounted rates. However, it might be worth your while to book in advance and mention that you'll be staying there, as I would think that if you waited until you arrived to book a treatment, there would be limited or no availabilty. I would have no hesitation in recommending a stay at this hotel to anyone! Fabulous hotel, rooms, food and amazing leisure centre....great location near shops, pier, sea walks etc. Most enjoyable two days. Will be back.